Crowds came out in force last week to celebrate Hattersley’s official Christmas light switch on. Hundreds of residents braved the winter showers with their brollies, where they were treated to live musical performances from Pinfold School Choir and St James’ Brass Band. 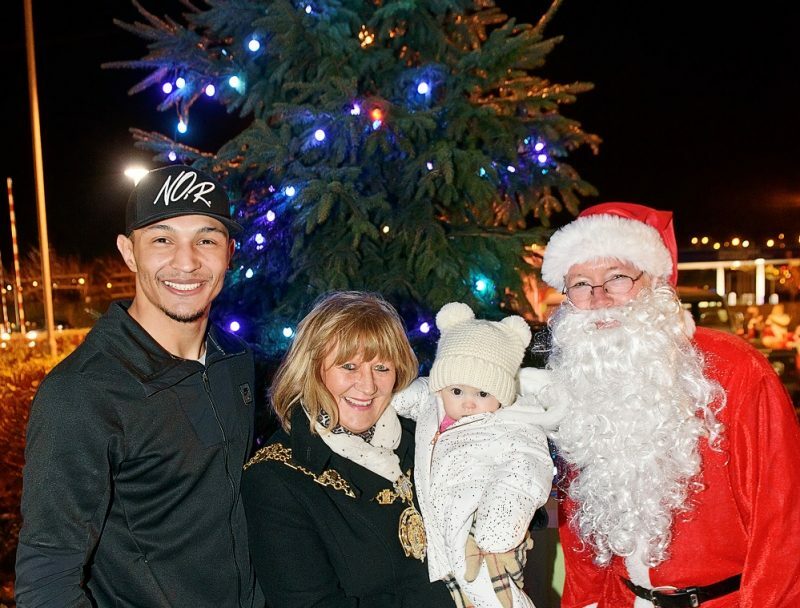 The Christmas lights were officially switched on by the Civic Mayor Cllr Denise Ward, along with local boxer (former WBC boxing champion) Marcus Morrison. The special event took place at the Hub off Stockport Road last Friday (30 November) and was organised by the local community and supported by Onward. Inside, those attending could pick up festive treats from Christmas markets, and the Hub Art Club were also in attendance, showcasing some of their fine artwork on offer. The event was topped off by some festive carol singing led by Hattersley Baptist Church, along with a special appearance by Santa himself to the delight of the youngsters attending. The 15ft tree is located at the front of The Hub and is visible from Stockport Road. It will be available to view until 2 January.